Background: Significant mortality and morbidity occur after major lower limb amputation for diabetes-related foot complications and peripheral arterial disease. Risk factors for atherosclerosis and medical comorbidities are common in amputation for diabetes-related foot complications and are major determinants of outcome. Conversely, the effect of posthospitalisation circumstances on outcome has not been systematically studied. 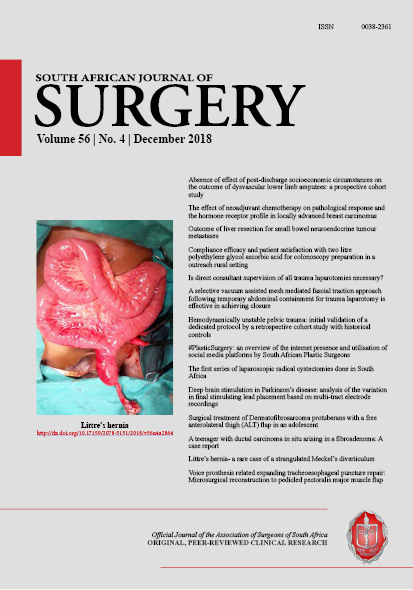 We hypothesised that poor socioeconomic circumstances after discharge would have an adverse effect on the outcome of major amputation in a developing country. Objectives: To determine the association of the status of post discharge socioeconomic circumstances on the outcome of dysvascular amputation. Methods: This was a prospective cohort study. Patients scheduled for major dysvascular lower limb amputation were recruited. Data were collected regarding the socioeconomic circumstances to which patients would be discharged, such as housing, income and personal care. Patients were followed up at our hospital, at clinics and later telephonically for three years. Mortality and wound morbidity were documented. Association of differences in status of socioeconomic factors and outcomes was analysed statistically. Results: Ninety nine patients were enrolled. Eight patients died in hospital and 91 were discharged. The socioeconomic circumstances of discharged patients were relatively favourable, the majority living in brick houses (92%) with running water (87%). Most patients had a regular income (86%), more than half had state/government grants. The availability of co-habitants, care givers and accessible medical facilities was also favourable. None of the different socioeconomic status levels demonstrated an effect on morbidity or mortality, all associations having a p-value greater than 0.05 (Chi-squared Fisher’s exact and Spearman’s rank correlation tests). Conclusion: No association between socioeconomic status factors and post-discharge outcome of amputees was demonstrated. This is probably because the dysvascular amputees in this study cohort were living in relatively favourable circumstances.